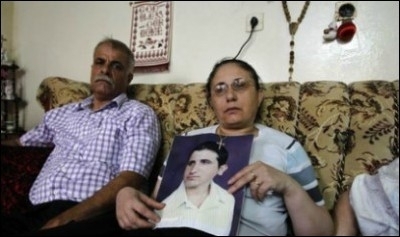 A Palestinian Christian family holds a picture of their abducted son, whom officials said willingly converted to Islam. The plight of Christian living in Gaza under the Palestinian authority continues to worsen. According to a new Arabic language report, recent years have "witnessed a critical upsurge against the Christians," who only amount to approximately 2,500 people—surrounded by approximately 1.5 million Muslims. Local authorities have abandoned the tiny minority to Islamist elements who have "placed great and continuous pressure" on the Christians. "At times we hear of the bombing of a Christian bookshop and assaults on churches and other Christian institutions; other times we hear of the kidnapping of Christians and the coercion of them to embrace the religion of Muhammad," says the report. In mid October, Christians in Gaza led a protest, calling for the return of their kidnapped children and loved ones. They held up signs saying "I am a Christian and boast of my cross." Bishop Alexios of the region "confirmed that the Christians who converted to Islam did so under threats, coercion, compulsion, and force." His church also submitted a formal petition to the governor of the region, Ismail Haniyeh, calling on him to investigate matters, but received no response. The report adds that Gaza's Christians are calling on the Christian world to intervene. The bishop said that he is trying to communicate all of this to the Vatican, the United Nations, and the United States.